Adidas Supernova Glide 9 are neutral cushioned running shoes. The renovated Adidas Supernova Glide 9 updates one of the most popular sagas among neutral runners dropping the Boost buzzword from its name since it showed up first in the sixth edition. Current edition adds more Boost™ in the midsole looking for improved response being a great choice for both long distances and daily workouts, just one step above the more responsive and lighter Adizero Boston 6. 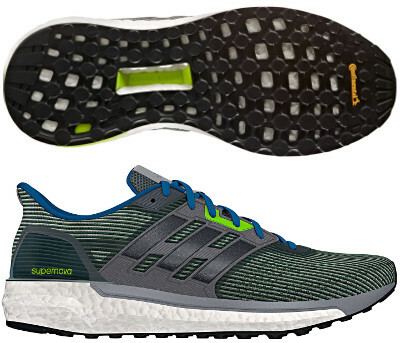 There are many changes compared to its predecessor Supernova Glide Boost 8 with an enhanced engineered mesh upper for a more comfortable feel and FitCounter™ moulded heel counter inspired on popular Ultra Boost ST. Achilles fit system (named "S-Curve") adds protection and prevents slippery while lightweight TPU panels wrap midfoot for custom fit. As mentioned above the amount of Boost™ foam has been increased in the midsole at the same time EVA piece has been removed from the heel which raises some concerns about stability. Another interesting change takes place in the outsole with grid design (aka StretchWeb, successfully premiered in Energy Boost 3) made of Continental™ rubber for more secure toe off and better grip even on wet surfaces. As usual in Adidas runngin shoes, Torsion® system features natural integrity in the midfoot for good stability decoupling forefoot from rearfoot.